Editor's note: From the typewriter to the propelling pencil to our favorite, the world wide web, inventors and innovators from the United Kingdom have brought us brilliant advances that have changed the way we work all around the world. Over the next few weeks, we’ll share a handful of stories from disrupters and trailblazers in the UK who are using Google Apps for Work to enable new, better ways of working in their organisations. Today, we hear from Sharon Cooper, CTO of BMJ a subsidiary of the British Medical Association that advances healthcare worldwide by sharing knowledge and expertise. BMJ published our first medical journal in 1840 and moved to BMA House, an Edwardian building in London, in 1925 where we still operate. We have evolved as a digital business and the way we work has changed significantly over the years. While covering the discovery of chloroform and reporting on the controversy of the MMR vaccine, we’ve also transformed from a print-based publisher to a digital information services provider with a team spread across 12 countries. It wasn’t always that way: until our recent effort to make our business more inherently digital, technology used to hold us back. Our antiquated email and calendars randomly deleted appointments, which caused us to miss crucial senior sales meetings, delaying projects and even derailing sales opportunities — issues that we estimated cost £30K a month of lost revenue. Because inbox storage was so limited, people forwarded emails to their personal accounts. We had no BYOD policy, so we relied on company-provided hardware, and sent UK PCs out to staff in India. 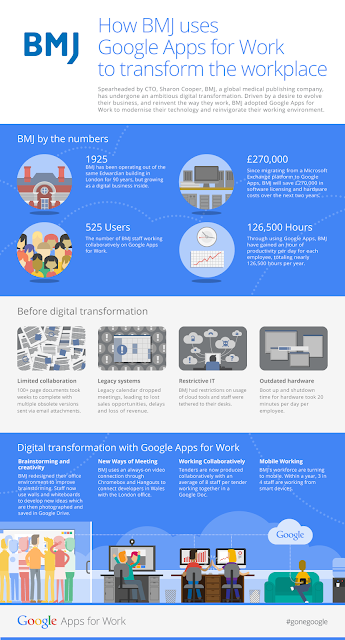 Our ongoing investment in cloud-based technologies lead to a decision last year to invest in Google Apps for Work. We now work together more seamlessly and share ideas more readily, whether we’re brainstorming around a ping pong table in our London office or meeting via Hangout with a colleague working from India. Here are four ways we’ve started working together differently over the past year. The way we respond to government tender documents exemplifies our new way of working. These 100-page documents, full of dozens of complex tables, used to take two weeks to complete. Now, we create a Google Doc and work collaboratively. Whenever we need someone to insert information or provide specific feedback, we tag them in a comment and they know to jump in and add their edits or suggestions. We save time and avoid confusion by relying on Docs for this kind of collaboration rather than turning to long chains of emails with version after version of attachments. It’s a radically different, more streamlined process. Technology has changed the way we meet. My London developer team uses an always-on video connection through Chromebox and Hangouts to connect with our team developers in Cardiff, so we feel like we’re one team in a single office, despite the distance between our desks. Teams throughout BMJ coordinate meetings using Google Calendar, create agendas in Docs, and host Townhalls for our whole staff using Hangouts On Air — that way, anyone can join whether they’re in Portland, Oregon or Dubai. Getting all 500 employees involved requires zero cost and minimal planning or technical expertise. We’ve redesigned our physical environment to brainstorm and test new product ideas with our users. People can write and draw on the walls, which are covered in whiteboards and post-it notes, then take photos of the notes and save the images in Drive, so they can refer to them later and share them with people who couldn’t be there in person. A year ago, we were tethered to our desks. Now, we can access our email and files on smartphones and tablets, thanks to the Gmail and Drive mobile apps. This means our executives can run our portfolio of over 30 products whether they’re in the office or travelling around the world. Our Editor-in-Chief, who frequently travels for work, quickly views and approves the weekly digital and print issues while on the go, using Docs and the Drive app on her mobile phone. Thanks to Google Apps, each year we save £135,000 in software licensing fees and hardware costs and an additional 126,500 hours of productivity. But perhaps more importantly, we’ve changed the way BMJ works together to build a healthier world.